When people find that a friend has been afflicted with a fatal disease, most keep away. It is not that they do not care; more often than not, it is just plain fear. They do not know what to say if they visit. Therefore it is easier to keep away. They seldom have any idea of the pain and rejection that the patient will feel. Since I was diagnosed as terminally ill this summer, friends have rapidly disappeared. I can count my real friends on the two fingers that I’d like to raise to the rest of them. It’s hard being friends with someone who’s dying, I know – I’ve been in that role myself – but it’s harder being the person saddened by the lame excuses for not making contact. These all begin with, “I’m sorry I haven’t been in touch, but…” A text from a “friend” of many years told me she’s been “busy, busy, busy”; another has been so tired after gardening she hasn’t been able to email. Another doesn’t know what to say. Well, how about talking about work, kids, partners, politics, weather, what’s on TV – like we used to? Then there’s, “But I pray for you every day.” Every day? Does your compassionate God not tell you that he’s heard your prayers before, to stop repeating yourself, get up off your knees, pick up the phone and talk to me instead? I listen to the excuses and say I understand, but I don’t. The two people who have been friends don’t do anything different. They just carry on visiting and having a laugh; they keep the emails coming and share their news with me, even when I’m not well enough to reply. Do those who’ve made the excuses believe what they say, or will they, for my funeral, suddenly find the time to attend, weep and say how much they miss me? All those friends who do not call (because they dont know what to say) perhaps could be helped by a bit of education – like reading this article. We have for too long been a death–denying society that articles like this, or discussions on the matter, are such rare events! We have been so used to working in cramped quarters at Trivandrum Institute of Palliative Sciences (TIPS), that the availability of some space (albeit rented) for our Training Center is such a great luxury. Now there is some comfortable space to work in – when the volunteers come for their training programs, or when doctors, nurses and other professionals come for their six weeks’ courses. (We have six such courses in a year). And we thought it befitting to name the center after Mr Bruce Davis. He funded the construction of the Institute of Palliative Medicine at Calicut, and is supporting us as well as several palliative care centers in India. He provided the funding for the “Bruce Davis Gold Medal” in Palliative Medicine for young doctors. Bruce is a great human being who does not like to be in the lime light, few know him for his great contributions to Palliative Medicine in India, Hong Kong, UK and elsewhere. Sorry, Bruce, for putting up all this before the world to read, but we thought it important that contributions like yours are better known. They would so inspire others! The Worshipful Mayor of Trivandrum, Ms K. Chandrika lit the traditional lamp at 5.30pm on Tuesday 01 November 2011, thus declaring the training center open. Dr Vijayakumar, Professor of Community Medicine at Trivandrum Medical College, Dr M. Balakrishnan from S.U.T Hospital, Sri Vijayakumran Nair, founder of Rajeswari Foundation, Dr George Varghese from Ebenezer Palliative Care Center and Justice Hariharan Nair were among the dignitaries who attended the event. New Indian Express and The Hindu came out with reports on the function, read them below. The one in the New Indian Express showed a picture of “Cuckoo”, the boat that Bruce Davis and his wife had for 32 years. Sale of the boat had enabled funding the furnishing of the training Center. New Indian Express, THIRUVANANTHAPURAM: What was once a boat that sailed in the seas of the West, has now become a training centre for doctors and nurses in palliative care, in the capital city. ‘Cuckoo’, the sailing boat that belonged to UK businessman Bruce Davis and his wife for over 32 years, was sold and the proceeds donated to city-based NGO Pallium India for setting up a training centre. “Over the years, I have developed an enormous admiration for the palliative work done in Kerala and the interest and caring attitude shown by literally thousands of volunteers who are associated with this work,” said the limelight-shy Bruce Davis in an e-mail. This former businessman from Cornwall, in UK, had lost both his father and mother to cancer. Bruce Davis and his family members then set up a charitable trust for work related to pain relief for cancer patients. “Our medical education is focused on imparting knowledge and skills, the head and the hands. What is often missing is the heart, or the attitude. We aim to integrate all three at the training centre,” said Dr M R Rajagopal, chairman of Pallium India. Incidentally it was this trust that financed the Institute of Palliative Medicine in Kozhikode, after Bruce Davis came to know of the remarkable work being done there through Dr Robert Twycross from UK, who was in India to attend some workshops. Later Bruce Davis got involved with the hospitals at Vellore and Guwahati too. “With palliative care attaining the form of a movement in the state, many health professionals, not just from other parts of the country but even from countries across the world, especially South-East Asia, used to visit us to learn and get trained. We never had even a proper workspace for them,” said Dr Rajagopal, who has named the centre after the philanthropist as Bruce Davis Training Centre. A significant chunk of the training at the centre will be on communication, listening to the patient and the family, understanding their problems and not just the disease, and giving a person-centered care, attending to the psychological, social and spiritual problems of the patients. Apart from this, the course covers the ethics of care, classification, assessment and management of pain, use of pain-killers, opioid pharmacology, opioid responsiveness, adverse effects, interventions in pain management and so on. The Hindu, THIRUVANANTHAPURAM: Pallium India, which has been spearheading the palliative care movement in Kerala, has opened the first formal Palliative Care Training Centre in the city. The training centre has been named Bruce Davis Training Centre, in honour of Bruce Davis, head of a UK-based charity trust, who has been a benefactor of the palliative care movement in India for over a decade now. The training centre was inaugurated by the Mayor, K. Chandrika, here on Tuesday. “The Medical Council of India had taken a decision in December last to begin MD course in Palliative Medicine. While this is a positive development, it could be a while before this gets to the implementation stage. The new training centre is Pallium India’s effort towards encouraging professional education in palliative medicine, the chairman of Pallium India,” M. R. Rajagopal, said. “We have decided to name our centre after Bruce Davis, out of our affection for this individual, who has been personally involved in the palliative care work of Pallium India and has remained a source of great inspiration and strength for us,” Dr. Rajagopal said. Bruce Davies had set up his charitable trust in the UK in 1967 and was working in the area of cancer care. By the 1980s, the work done by the Trust had spread nationally into a most effective force for the relief of pain, both physical and mental, for cancer patients and others suffering from terminal illnesses. Following the great improvement of cancer care in the UK, the Trust decided to use the expertise that they had gained in the home environment for the betterment of cancer care services in other countries where such services were almost nil. The Bruce Davis’ Trust’s association with the palliative movement in Kerala began in the late 1990s when one of the Nurse Consultants of the Trust visited Kozhikode. Since then, the Trust has been supporting all activities related to the palliative movement in Kerala financially as well by way of rendering training to nurses and volunteers. The new training centre set up by Pallium India is intended as a national-level centre to train doctors and nurses and to empower NGO initiatives in the area of palliative care because formal training facilities in palliative medicine is next to nothing in the entire country. The six-weeks’ course which has been planned by Pallium India now will devote one-third of the training programme towards pain management while another one-third will deal with how psychological and social support should be extended to patients as well as addressing issues of rehabilitation. “How should a doctor `listen’ to his patient? Learning to listen to a patient and to respond to him/her is something that a doctor working in this field should train himself for,” Dr. Rajagopal said. Cancer Aid Society Palliative Care Award 2011: Apply or Nominate Now! India’s Cancer Aid Society (CAIDS) invites applications and nomination for the CAIDS Palliative Care Award 2011. CAIDS is an Indian NGO working Nationwide since 1987 on Palliative Care, Advocacy, Tobacco Control, Cancer and Non Communicable Diseases Prevention and Control. The award winner will be presented with a plaque and a prize of Rs.100,000 in February 2012 at the 19th International Conference of the Indian Association of Palliative Care, Kolkata. The “Life Before Death” series of short movies continue to be released one every week. They are not only very informative to the public; but also make powerful advocacy material for the palliative care community. Thank you, Mike Hill and team of Moonshine Movies and thank you, Lien foundation,International Association for the Study of Pain, The Mayday Fund, the Union for International Cancer Control and The Institute for Palliative Medicine at San Diego Hospice International Programs. Sometimes, when the day is bleak, and there seems to be only darkness, callousness and cruelty all around you, there comes a ray of sunshine. Anyone who visits the 13-year-old spastic child Arun G Raj – confined to a leaky brick-walled room – would realise how blessed they are. So it was for the 15 students of the Holy Angels’ School, who saw him at Panathura on Monday. The students and teachers of the Holy Angels’ School had decided to help this teenager, who cannot walk, stand or even sit without help, after reading an article titled ‘Care From a Mother’s Heart’ published in the City Express on September 16. The students, motivated by their principal Sr Linis Noronha, started a campaign on the ‘Joy of Giving’ week, collecting little donations to help Arun in some way or the other. They interacted with the NGO Pallium India, to decide on the best way to help out Arun’s family. Little acts of kindness finally heaped into a massive Rs 76,500, almost the amount that the building engineers said would be needed for renovating the little shack which belonged to Arun’s aunt, Suprabha. A widow herself, Suprabha has been giving shelter to Arun and his mother Ajitha ever since Arun’s father died. Not only will these students be able to replace the leaky roof, but the money can also light up the little house where Arun lives. Until now, the nights were jet black; for, they could not electrify the house with the leaky roof. Electricity might also mean that the life of little Arun can be made happier with music, because Arun shows a keen interest to the different sounds he hears. The dismantling of the roof, concreting and electrification is estimated to cost Rs 80,000. Plastering and changing window shutters would need a little more money. Ajitha, Suprabha and the volunteers of Pallium India hope that the light lit by the youngsters would be carried on by others in the society. 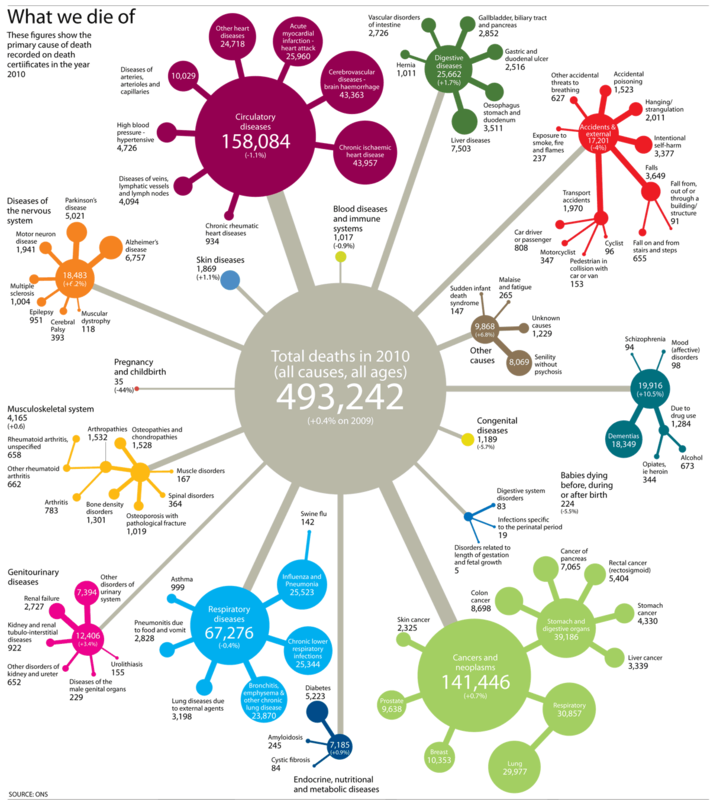 A report in The Guardian’s Datablog brings our attention to the latest statistics on the causes of death in England and Wales. Behind the falling death rates, maybe we can see the cheering face of improved health care? .. whatever we may worry about, this is one of the safest times to be alive, ever. But really? The statistics also shows that deaths from Dementia and Alzheimer’s are rising. Steeply. “Safe times” to be alive for many years with dementia? Essentially, other causes of death are going down – and people have to die of something! An invitation from MNJ Institute of Oncology & Regional Cancer Centre, Hyderabad to the One Month Certificate Course in Palliative Care for Doctors, Nurses, Social Workers and Volunteers. This one month course will be conducted by MNJ Institute of Oncology in collaboration with INCTR and Pallium India. This is an opportunity to learn managing chronic pain, difficult symptoms, difficult issues around end of life care and communication skill training. Dr. Gillian Flyes, Ms. Ann Syme and Ms. Zahra Lalani from British Columbian Cancer Agency (BCCA) will be the External Faculty for the course. What is an Amusement Train Doing in a Hospital? Here is a small train that whistles through the sprawling 16-acre cancer hospital, Cancer Centre Welfare Home & Research Institute (CCWHRI) at Thakurpukur, Kolkata. CCWHRI was created by a great visionary, the late Dr Saroj Gupta, and is currently managed by his sons, Mr Anjan Gupta (an architect) and Dr Arnab Gupta (a surgical oncologist). People with cancer already have the disease and treatment (with all their psychosocial implications) to grapple with. Why must they also be in a grey, bleak environment? Even if all hospitals do not have amusement trains and fountains, at least we can learn from them enough to think not only of disease and treatment but also of the windows and the trees? Simply wheeling someone out in the evening to be among some greenery and flowers may do a lot of good to the human spirit! Laughing at Death: A Great Lesson in Acceptance! Here’s another story from The Guardian, the story of a father and son laughing over a stroke, then cancer and eventually death! Dad was diagnosed with cancer in 2008, and one of the first things he said to my mum was “Well, that’s Jason’s next Edinburgh show sorted then.” He wasn’t far wrong. My 2007 Edinburgh Fringe comedy show, My Confessions, had documented his stroke and recovery and my 2008 show Joy talked about his cancer diagnosis and death. The truth is that my dad and I had written most of the show together. He was and is my inspiration. My father, Tony Cook, was born in the Tyneside shipyard town of Hebburn, where we lived. He was a big, broad-shouldered fellow, with huge forearms and thick hands and the kindest eyes anyone has ever seen in a human being. They were eyes that always had a twinkle in them, so when you were talking to him you always thought that he might take you out to do something impish. I followed Dad into the merchant navy at the age of 19. We became easy workmates and drinking buddies. Towards the end of his career, he became a consultant for the company and joined the same ship I was sailing on but was not a ranking officer, so I was technically senior to him on board. It never affected our closeness. The International Association for Hospice & Palliative Care (IAHPC) is proud to announce a public call for nominations to 6 seats in the IAHPC Board of Directors. IAHPC members are invited to nominate health professionals actively working in hospice and palliative care with demonstrated interest in the development of international palliative care initiatives and issues. Have been active members of IAHPC for at least 3 (three) consecutive years at the time of nomination. Have demonstrated work and commitment in palliative/hospice care in his/her field. Currently holding or having held a position within a teaching hospital, university or palliative care organization. Have demonstrated willingness to participate and work in the board activities including working groups and task forces. Be able to communicate effectively in English. Candidates must have access to the Internet and hold an active e-mail account. Nominators may nominate one candidate only. Deadline for nominations is November 30, 2011. We invite members to participate in this important process by nominating a candidate. Individuals who are not members and wish to also participate, may join through our website by clicking here. After the nomination, candidates may be contacted by the governance committee for additional information. The term of the new members will begin on January 1, 2012 and will end December 31, 2014. The new directors will be elected by a vote of the current Directors and will be announced in December 2011. We look forward to your participation in this process and to the nomination of candidates. Ms Poonam Bagai, chairman of Cankids, writes from Delhi calling for a pediatric palliative care physician for a project assignment of 3-6 months. We have a place for them to stay, and language will not be a problem because the rest of the team is Hindi-speaking. Cankids can pay Rs. 45,000 a month and if someone is willing to stay longer, that is welcome too. Please see the attached information for details and please transmit this to anyone you think may be interested. Do you know what a bystander is? It is an Indian phenomenon. A relative who endlessly stands by anyone who is admitted to hospital. By definition, he/she is not expected to sit down, let alone lie down. Most hospitals will not permit more than one of the species to be with the patient, and that person will always be busy. This dreadful title is another way of depersonalising a human being, and the medical system is hardly aware of the implied insult. Each time nurses used the word bystander, I wished them to address me as Sainaba’s daughter. But they never cared for my feelings. And why should they? They are seeing hundreds of bystanders each day.But why dont they at least think they too will be called as a bystander by someone, someday? They repeatedly called me bystander before the doctor even though thay made friendship with me. I wondered why they want to punish me for nothing. After all, how long I can be called in the presence of my mother as her daughter! If I was in my usual self, I would have picked up a quarrel with them for not showing mercy towards all those bystanders who care their dear ones. But as the situation was not meant for creating ugly situations in front of an ailing mother, I gulped down all my frustration without a complaint and rushed to them waiting for their next word like a lifeless rock. I still dont understand why our hospitals call a person who cares their dear ones as bystander? Why dont they use the word carer instead of bystander? Will someone answer, please? Nazeem is waiting. I am delighted to inform you that the 19th International Conference of the IAPC will be held in Kolkata, 10-12 February 2012. The theme is “Education, Training and Research in Palliative Care”. What’s Common Between Palliative Care in Kerala and Malaysia? Pallium India had the privilege of attending a planning meeting organized by the Division of Palliative Care of Malaysia’s Ministry of Health in Kuala Lumpur, 8-9 November 2011. The division is headed by Dr Richard Lim, who, in the 1990s, had come as a young doctor to spend time with palliative care workers in Kerala. The partnership between Government and Non-Government Organizations adopted by Kerala’s palliative care policy came up in discussion at the meeting. With the blessings of Dr Azmi Shapie, the Health Ministry’s Director of Medical Development, the meeting decided to develop the framework for an action plan for Malaysia. The meeting, as well as the progress in Malaysia would offer useful lessons for us in India, especially considering that even after a quarter of century of palliative care in India: 99% of our population has no access to it. Malaysia is way ahead of India in access to palliative care, though the state of Kerala might be an exception. Would you mind very much if we end this newsletter with a quote that is not strictly palliative care material? Well, why not? Is there any law which states that palliative care people must always talk palliative care? We got the following gem from Dr Shakti Kumar Gupta of the National Initiative in Patient Safety (NIPS). “When someone pays you a compliment, never interrupt. Wait till the person finishes, smile and say, “Tell me more”.